Dow Corning Diffusion Pump Fluid - DC-702, 704, 705 - Inland Vacuum Industries, Inc.
Dow Corning® has discontinued this line of silicone diffusion pump oils. 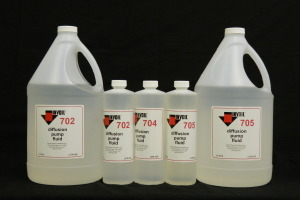 Customers looking for the DC-702, 704, and 705 silicone fluids, please see our Invoil-702, 704, and 705 product page for a direct equivalent. Dow Corning® diffusion pump fluids are designed for high vacuum and for fast pumping of large volumes of gas or vapor in production operations. Dow Corning 702, 704, and 705 are thermally stable, oxidation resistant, and chemically inert silicone vacuum fluids that offer quick pumpdown and longer fluid life. They also allow diffusion pumps to operate at higher forepressures than those using hydrocarbon or synthetic fluids, resulting in faster pumping and a more efficient vacuum system. Dow Corning diffusion pump fluid can attain low vapor pressures, thus reducing backstreaming and eliminating the use of traps for many applications. Dow Corning® 702 is a general-purpose fluid designed for fast pumping of large volumes of gas. It is used to produce vacuums in the range of 10-5 to 10-7 torr. It is also used in vapor ejector pumps that attain vacuums of 10-4 to 10-5 torr. Dow Corning® 704 is a single-component fluid for high vacuums of 10-6 to 10-8 torr (untrapped) and 10-10 to 10-11 torr (trapped). It performs well in tough, rugged applications and offers quick pumpdown, even after exposure to air at operating temperatures. Dow Corning 705® is a colorless to straw-colored, single-component fluid designed for ultra-high vacuum applications in the range of 10-9 to 10-10 torr (untrapped) and 10-11 torr (trapped). The vapor pressure and backstreaming rate of Dow Corning 705 Diffusion Pump Fluid are so low that use of traps or refrigeration is unnecessary for some ultra-high and ultra-clean vacuum applications. It has the highest phenyl content of all silicone diffusion pump fluids and the best resistance to radiation.